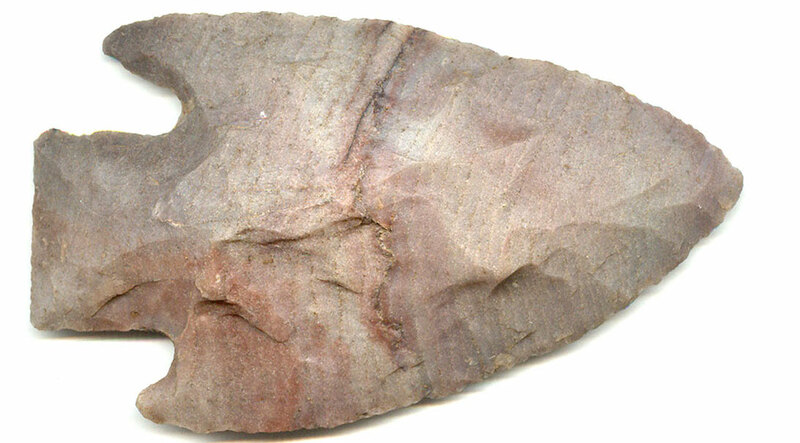 A Medium Size, Colorful, Sturdy And Well Made, Little River Point That Exhibits Stone Coloration Aging And Heavy Surface Patination, Aging In The Notching, Aged Surface Mineral Deposits, Correct Archaic Style Blade Flaking, Correct Blade Sharpening Use Reduction, Aging In The Surface Stone Fractures, Correct Material And Manufacture For The Type And Area Found. Ex-Earl Townsend And Tony Putty Collections. The Type Was Named By Gregory Perino, For 2 Caches Found Near The Little River In McCurtain County, Oklahoma. This Is A Nice Example Made Of A Very Nice, Local Material! Includes A Ken Partain Certificate Of Authenticity!